It is recommended that your brake fluid is renewed every 2 years. This is because brake fluid is hygroscopic, which means it is able to absorb water molecules from its surrounding atmosphere. 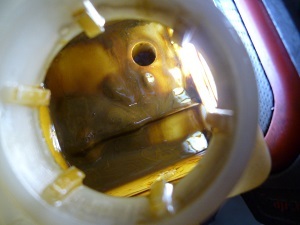 Failure to refresh the fluid will result in a loss of effectiveness of the braking system, as the properties of the fluid are changed by the water content, particularly the boiling point. Taken to an extreme, not flushing the system with some regularity, can result in a mayonnaise-like accumulation, like that seen here. Needless to say, the brakes on this car were hugely improved by cleaning the reservoir and thoroughly flushing the system with new fluid. 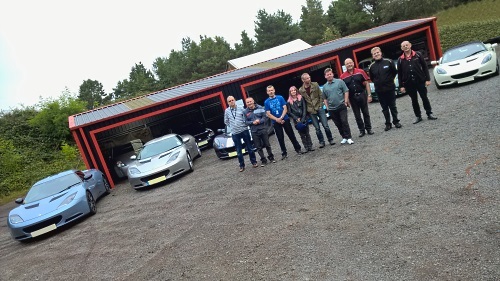 At the weekend, we were visited by members of the local East Anglian Lotus Club. Twelve Lotus, and a couple of interesting other cars, made their way in convoy in less than ideal conditions, but a warm welcome awaited at Hangar 111. A range of vehicles were on display at the workshop, ranging from a very tidy early S1 Elise, to the latest Evora 400, via S2 Exige and Elise, and an LF1. The championship-winning Hangar 111 Racing Elise Cup R was also present, demonstrating our state-of-the-art alignment rig in action. Some of our current parts catalogue were available for hands-on perusal, which showed some of our developed upgrade parts, such as the Signature exhaust range, JRZ suspension, and others. Also a number of factory and everyday parts, including the ever popular Elemental shower caps and Stormforce car covers. 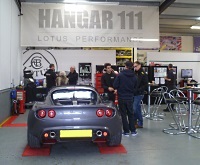 A steady supply of tea and coffee, and a buffet lunch kept attendees topped up, whilst there was plenty of time to meet and chat with the H111 team about all things Lotus. Our guests were also given an introduction to our new rolling road dyno booth, with a show-and-tell from Greg giving the low down on how the dyno works, and how it enhances our diagnostics and tuning services. It was great to welcome club members to the workshop, we hope they enjoyed their visit, and our thanks to EALC for a good turnout of cars, and their enthusiastic drivers and passengers. 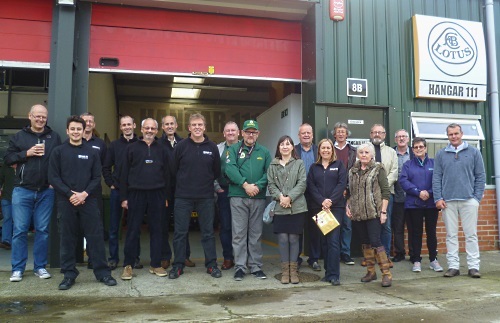 The first of our performance driver training days took place last week at Millbrook. Despite the weather taking a turn from the recent sunshine, a warm welcome was assured by Colin, Jo, and Paul at CAT Driver Training. The Millbrook experience is unique, and starts as you pass through security and are escorted via part of the Alpine test track to CATs base hidden away in the middle of one of the test loops. CATs range of test and race cars welcome you and your Lotus, as well as Jo’s seemingly never-ending supply of tea and coffee! The day starts with a short interactive briefing from Colin, to learn a little about everyone in the group, their experiences and ambitions for the day. Colin then introduces the schedule for the day before getting straight down to business with learning about braking. Out onto the mile straight, which is what it says, and allows you to ensure your braking techniques are tuned, before moving onto to the going faster lessons. The activities continue with a visit to the high-speed bowl, the opportunity to learn more about steering, and the handling circuit, to further add understand of weight transfer and grip. A short respite for lunch, is followed with some theory on cornering and trail braking from Colin. Then it is out onto the alpine loop circuits, to put it all into practice with the added challenge of sharp gradients and heavily cambered, changing road surfaces. After some grip limit tests, it is time to put it all together and have a little fun with the gymkhana, a short course against the clock, and your fellow attendees. The day is finished off with a prize for the best performance in the gymkhana, and Colin and Pauls driver of the day accolade. We hope to be able to run some more dates next year, starting in the spring – keep your eyes on our newsletters for dates and availability. 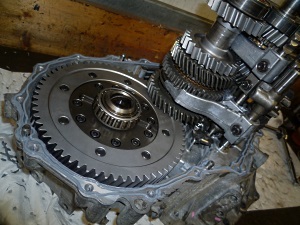 Here at Hangar 111 we are fully-equipped to rebuild all of the gearboxes found in the modern Lotus cars. From the PG1 in the Rover K-series powered cars, through the C64 in Toyota 2ZZ, to the EA60 and EC60 in the current production models. We have the specialist tools and experience of rebuilding many gearboxes both as standard, as well with uprated components such as stronger bearings, final drives, limited slip diffs, etc (all available in our online store!). So if your ‘box is sounding tired, or you are looking to upgrade, why not give us a call – you may be surprised the improvement it will make to your driving experience! 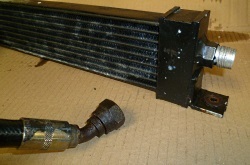 This affects Elise S1 / Exige S1 / 340R and Rover K-Series models fitted with original equipment front-mounted oil cooler. We have been carrying out numorous factory oil cooler recalls on Toyota 2ZZ-engined cars, where oil hoses are separating from the unions that are fitted to the oil coolers and sandwich plates. More recently we have found the same situation on a much earlier Elise Sport 160 which features similar pressure-fitted swaged unions. The main difference with the earlier cars is that the oil hose itself has been perished and found to be cracking. This could of course lead to failure of the hose, with subsequent engine damage, and/or fire, or worse still – an accident. Due to the use of the steel fittings on an aluminium cooler, often the fittings have seized due to corrosion over time. Since OEM parts are not always available, we have an alternative higher-capacity cooler radiator which fits in the original shroud under the crashbox. We are compiling a kit of parts to replace the original hoses, oil cooler and unions which will allow a full refresh of the oil cooling circuit for these cars. This year we are once again pairing up with our friends Colin and Jo Hoad at CAT driver training to arrange several unforgettable days of activities at Millbrook proving ground dedicated to you and your Lotus. As those who attended the last events we held will tell you, there is no place quite like Millbrook and certainly no road and track driver coaching quite like CAT can provide at this unique venue. 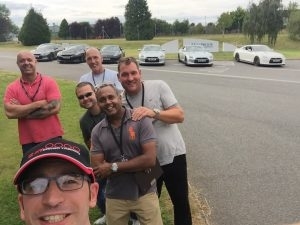 We would like to host 2 events this year, giving drivers the opportunity to bring along their cars and benefit from learning new skill and improving their techniques. Our team will be on hand at each event to provide technical support and to answer any questions you may have about what we can do for your Lotus. The price for each day is £400 per person. Attendees will require a Lotus and a valid driving license. Helmets will be available for hire on the day but please bring your own if you have one. Note on noise limits for Millbrook… “there is no limit unless you are a Le Mans Prototype or an F1 car”. If anyone thinks they can compete at that level on noise, be sure to mention it when booking! CAT Driver Training is run by Colin and Jo Hoad. Colin used to work for a leading motor manufacturer in the UK as a Vehicle Evaluator and Driver Trainer and has gained extensive experience and qualifications in driver instruction. This includes being certificated to instruct at Millbrook. His life has been spent working with his passion: motor cars – from racing minis to the race preparation of performance cars. He has much experience of vehicles on both road and track and brings a very different approach to driver enjoyment.